Financial disagreements are a strong predictor of divorce. 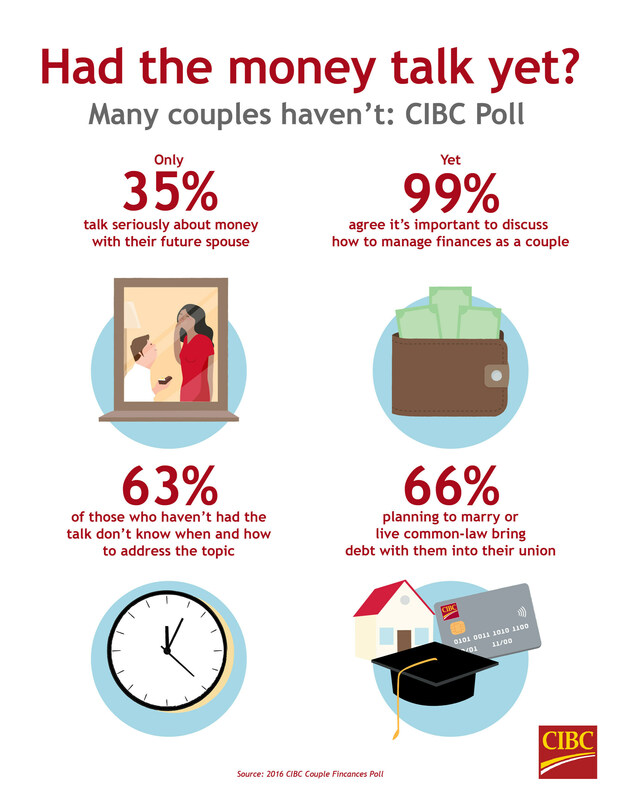 TORONTO — A new CIBC survey suggests nearly all couples believe it's important to have a serious joint discussion about finances before getting hitched or moving in together — but only about a third will actually do so. The study found that 35 per cent of committed partners who plan to marry or live common law within the next two years say they've talked about money in detail, with 40 per cent saying they've only discussed how to manage finances together as a couple "briefly." Despite those responses, 99 per cent of those surveyed indicated they felt it's very — or at least somewhat — important to discuss how they'll plan their finances as a couple before saying, "I do." The findings may in part explain why 46 per cent also said their top financial goal within the first two years of living together was to save up for a vacation, despite the fact that two-thirds of the respondents said they would be entering into marriage or a common-law relationship in debt. Jamie Golombek, managing director of tax and estate planning for CIBC, said in a report about the survey results that financial disagreements are a strong predictor of divorce, particularly among younger couples who are more prone to experience financial stress in their relationships. He pointed to recent U.S. research showing that couples who argue over finances several times a week are 30 per cent more likely to divorce than those who only have money squabbles less than once a month. Of those surveyed who admitted they haven't talked about money before their wedding day or the move-in date, 83 per cent said they didn't know either how or when to address the topic or said they plan "to play it by ear." CIBC's online survey was conducted from July 15-21 among 1,047 Canadian adults who are Angus Reid Forum panellists.